Stainless steel yarn is a world unto itself- light as a feather, but flexible, foldable, and bendable in a way no other yarn is. Stainless steel yarns are special- they are a core wrapped in wool or silk, so they are soft to the touch, perfect for a lovely lightweight scarf that is sure to inspire conversation! 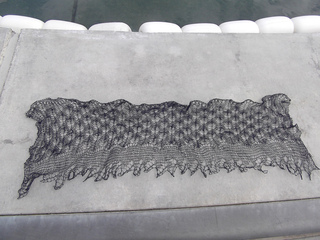 The entire scarf weighs less than a half ounce and stretches both length and widthwise! 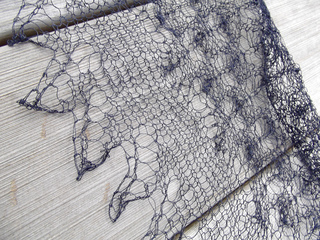 The scarf is knit in a long rectangle, starting with the edging, then picking up stitches to knit the body. Because the yarn bends and stretches to shape, no blocking is required! 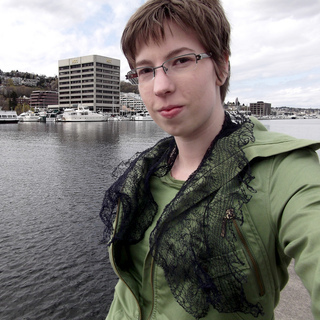 Every other row is garter stitch so the scarf is reversible, making it extra easy to wear! 310 yards lace weight stainless steel yarn. Sample knit in Silk Stainless Steel by Habu (69% silk, 31% stainless steel core; ½ ounce/14 grams; 311 yards/280 meters) in Navy. SS Fern is constructed in a rectangle. The edging is knit back and forth to form a long strip, then stitches are picked up- one for each garter ridge- along the edge and knit to for the body lace. 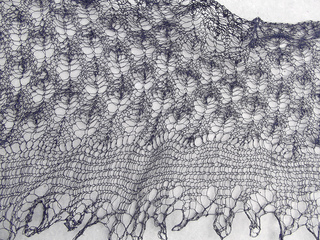 See pattern preview for notes on knitting with stainless steel yarns. Also available in print from Magcloud: SS Fern Print Version.